Who likes running with friends? Who likes celebrating after a race with friends and beer? 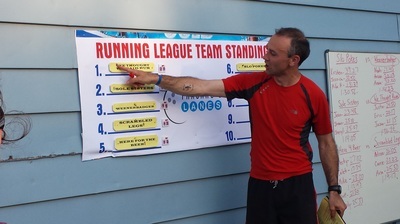 If you raised your hand to any of the questions, you might want to check out Running League – a newer series of local races geared toward bringing people of all running abilities together for race – and post-race – fun. Read on to learn more about the league, the courses and the awards! Can you start off by telling us a bit about what makes this race unique in the MKE area? There are bowling leagues, volleyball, softball, etc … but no running league. 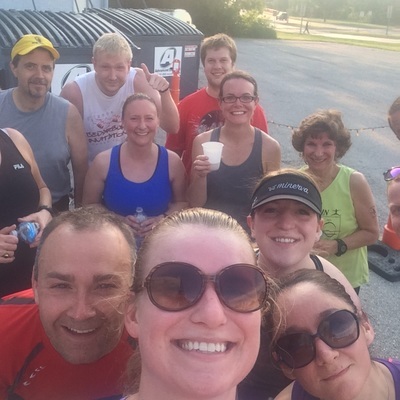 We started the very first running league that we know of and it’s a hit. We love the head-to-head matches each week where teams of all abilities can match up against each other because everyone has an average. Can you tell us a bit about the history of the league? How long has it been held in this area and why was it started? It all started in November 2014 at the Pettit Ice Center. That night after an hour run and a couple beers, Scott turned to Mike and said “we should start a running league.” Mike owns a bowling alley where he coordinates bowling leagues so a running league only made sense. Over the course of the next six months, after more hour runs and beers, they put together a website, Facebook page, talked with other race coordinators, set up a registration account on Active and advertised on Running in the USA. They aimed for May as their start date and now it’s into July, starting Round 3. What was behind the decision to make this more of a team-oriented event? The idea of a team-oriented league was really important to us. We loved the idea of runners putting together a team of friends and competing. We loved the idea of the “back of the pack” runners being able to talk trash to the “front of the pack” runners because everyone is on an even playing field. The goal is to run the fastest under your team average so that really benefits the runners who are improving each week. Do people need to sign up with a team or can they also sign up as individuals? Everyone should sign up individually and then let us know if you have a team. If you are a single runner we will create or find a team for you. How many teams are signed up to date? The first round we had 6 teams of 3; 2nd round was 8 teams of 3; and it looks like 8 teams are signed up so far for round 3. What would you tell someone who is thinking about signing up to encourage them to participate? Free beer afterwards! Oh, and it’s only $9 per race. Can you tell us how the awards work for this race? Each week the team that is the most under their team average wins $45 to split. Awards at the end of round 2 – 1st place overall received $60 to split and the traveling trophy, 2nd – $30, 3rd – $21, 4th – $15. What are the courses like? How did you select Frame Park and the travel date courses? And do you have any tips for runners hoping to crank out fast times? Frame Park works great because we start and finish at Mike’s bowling alley – Fracaro’s Lanes. The course is flat and uses most of the same course that other Waukesha 5k races use. Scott is an expert trail marker. He found a great one that starts and finishes at Stubby’s Pub and Grub on Humboldt. That course is little hilly and part trail. 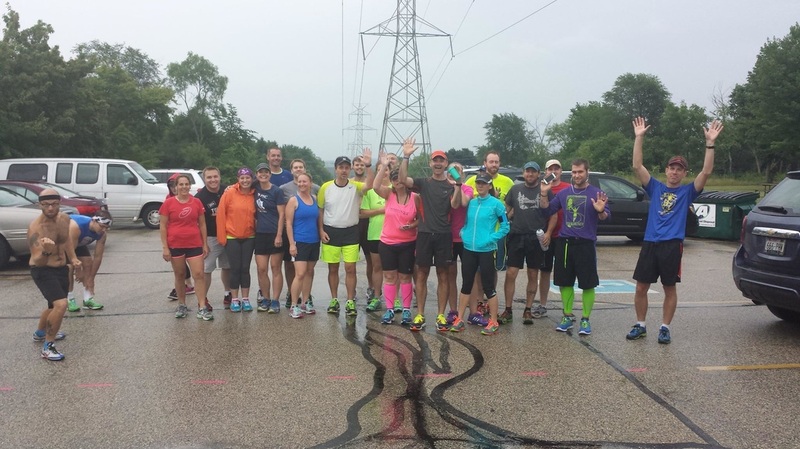 Minooka Park is a staple in a lot of Waukesha runners’ workouts. Scott marked a tough but great trail run that starts and finishes at a site we rented. All of these courses fit nicely with the extremely fun after-race party we have. What are some of the participant perks? Did we mention free beer? Also, the unbelievably great running leaguers put together a food sign-up online each week for after-race fueling and sustenance to soak up the beer. In the upcoming seasons/years – do you anticipate the league growing to include other locations in MKE? One of our dreams for Running League is to have several locations. For example – Running League Waukesha, RL Milwaukee, RL Tosa, RL Brookfield, RL New Berlin, etc., and then have a SE Wisconsin state tournament in which all the RL’s will battle each other to be Running League champions. We are looking for energetic people to help manage these other RL’s, specifically a league secretary/manager who can keep the energy level very high and the atmosphere exciting. Running League night is our favorite night of the week and we strive to make that the same for everyone else.